*5 Week Lead Time if not in stock. The Bentley-Harris Expando® 686DM is their elite flame retardant sleeve with an unequaled 200°C rating. 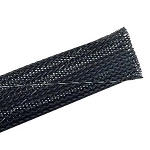 The open-weave braided sleeving, designed to protect hoses, wires, and cables, is resistant from collecting and trapping moisture, water, and humidity; also providing for easy installation with many sizes to choose. NASA favors this product due to its extreme polyetheretherketone guard (PEEK) strands with polyphenylene sulfide (PPS) support strands, which make up the highly durable open-weave construction. It also resists flame damage and high temperature air guns used with shrinkable elements. This tough, yet lightweight dual monofilament construction protects against abrasion, cutting, and chaffing with the highest thermal integrity consideration. Expando® 686DM materials yield low levels of toxicity, flammability, smoke generation, and hard vacuum off gassing; perfect for the most hostile environment. A diversity of applications for this thermal polyester sleeve is currently used by the marine, electronic, oil refineries, manufacturing, military, space and aeronautic industries. Although it is extremely durable, a hot knife or scissors can be used to cut this fray resistant braided sleeving for quick installations. 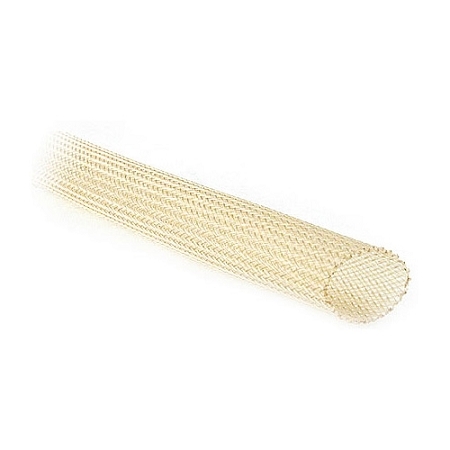 If your project requires the best product for the most hostile environment, there is no other better than this protective expandable braided sleeve! 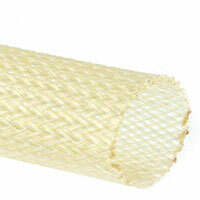 Bentley-Harris Expando® 686DM cable sleeve is UL recognized as a VW-1 component, F.A.R. Part 25 approval, RoHS compliant, will not rot, and has no shelf-life. Colors available are black and natural. For any other color requests, please call us. Thermal protection ranges from -94° F to 392° F or -70° C to 200° C.
Melt temperature of 285°C or 545°F. Meets F.A.R. Part 25 flamability requirements. VW-1 sizes over 1/8 inches. Low toxicity, smoke generation and offgassing. Featuring a dual monofilament construction. Expando 686DM blends larger PEEK guard strands with PPS support strands. ISO 14001 and TS16949 certified.